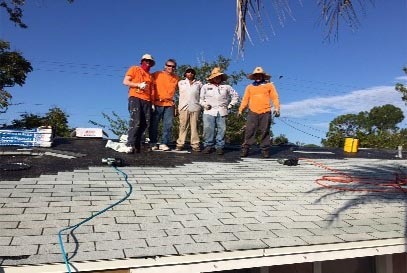 ‘Tis the Season for giving and Sutter Roofing gives a holiday donation by supplying labor and materials with the assistance of ABC Supply who donated the shingles for the project, giving the family a brand new roof for Christmas. Pedro Sagraves, Foreman from Sutter Roofing, along with a total of 10 crew members were able to tear-off and re-apply the roof system, not only to provide a functioning roof but also bringing the roofing system up to current Building Code. Habitat for Humanity Sarasota Inc. is celebrating its 30th anniversary this year. The agency provides safe, affordable homes to low-income working families. A dedicated, volunteer workforce provides on average 4,000 labor-hours per home, resulting in a 25%-30% reduction in construction cost. The organization builds new homes (and renovates purchased properties) with an emphasis on energy efficient features using building materials and techniques for sustainability, culminating in lower monthly expenses for homeowners.